Why Get a Tire Rotation for Your Kia at Our Dealership? Your Kia vehicle uses tires that are specifically designed to help your car or SUV run at peak performance. That's why it's so important to service your tires at Stevens Creek Kia in San Jose, California. Regularly rotating the tires on your Kia vehicle will prolong their life and make for a smoother ride. And every time you come in for a tire rotation on your Kia car or SUV, it gives our Kia mechanics an opportunity to inspect your brakes and the integrity of your Kia tires. This helps ensure the safety of your driving experience and helps keep you off the side of the road with a flat tire. Give Stevens Creek Kia a call today to schedule your next Kia tire rotation! At Stevens Creek Kia in San Jose, CA, we put your safety first. 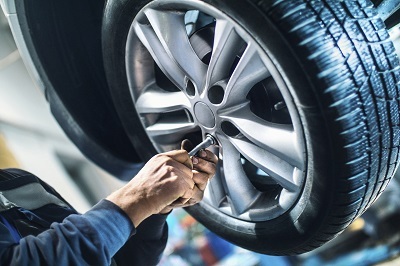 As a certified Kia dealership, our mechanics know all the ins and outs of your particular Kia vehicle and do an excellent job keeping an eye out for potential future problems whenever you come in for a Kia tire rotation. This includes looking at your tire treads, brakes, and alignment. And, of course, we do our best to get you in and out of the shop as quickly as possible! Visit our service center in San Jose, CA so you can get back on the road in no time! Stevens Creek Kia offers a variety of Kia maintenance services at our San Jose, CA Kia service center. Bring your Kia vehicle into for oil changes, fluids replacements, brake checks, and your 30K or 60K manufacturer-recommended checkup. Regular maintenance on your Kia Sedona or Kia Soul is critical for safe and comfortable driving. Next time you need routine maintenance done on your Kia vehicle, schedule a service appointment with the local Kia experts at Stevens Creek Kia!